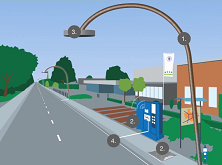 Dynamic Street Lighting is more than adjusting the intensity of the lighting source. It is a functional concept of lighting in which the brightness of a certain area is adjusted to the local and actual circumstances. The context determines whether lights can shine on full intensity or not. With the DAVI concept, multiple functions of lighting can be aspired, and even undesired effects of lighting can be reduced. For more information about DAVI, please click on the tabs below. The DAVI concept aims for an optimum between above functions and negative aspects. Increased traffic safety: because the lighting moves with the vehicles, the attention value of the road user is automatically higher. Next to that, suddenly crossing pedestrians and/or animals are automatically enlightened. This increases the traffic safety. Person- and object safety: the light intensity automatically increases if pedestrians are present in the subject area. This function provides liveability, and the probability for example burglaries is reduced. Minimal light pollution: If there is no traffic at the road, the light intensity will dim automatically. 'Follow-me' function of (moving) objects: at low traffic intensities, the lighting automatically follows any road user. Only necessary spots are then enlighted. Weather support: our public lighting system responds to weather conditions. If the sight of a road user is limited due to weather conditions like fog or heavy rain, the light intensity will increase. Next to that, the dynamic lighting can be used as visual guidance to indicate the road course. The light intensity is then adjusted to the required level. With dynamic lighting in combination with new solid state technology, the expectation is an energy reduction of 25% - 45% within the coming years. Cradle to cradle: minimal impact on the environment with material usage, installation and demolishment. If you have any questions regarding the DAVI concept, please don't hesitate to contact us. The DAVI concept is especially suitable for the modern DBFM (Design-Build-Finance-Maintain) contract forms, and meets the Corporate Social Responsibility (CSR) principles. The DAVI concept is a comprehensive solution for public lighting. This means that DAVI is a solution for the complete installation of public lighting, inclusive cables, protection, armature, lampposts and electricity distributors. By providing a comprehensive solution the DAVI concept can be adjusted to your personal requirements. This provides the most advantage for you, in terms of both functionalities and costs. iFuse technology, which provides a large reduction in cable costs.